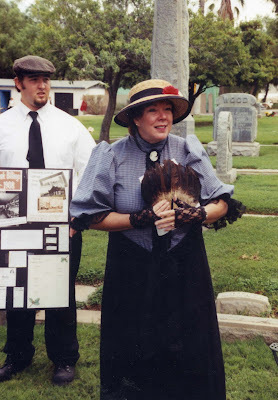 The Graveyard Rabbit: Meet: Diane Wright, "The Graveyard Rabbit Travels Wright"
Meet: Diane Wright, "The Graveyard Rabbit Travels Wright"
It all started with genealogy. Once I got hooked on that, it led to the cemeteries. After my grandmother died I wanted to see all the family papers. In the pile I found a deed to the plots that my Great Grandfather bought in Gowanda, New York. Up until then I had no idea that you got a deed for a cemetery plot. The paper specified that any family member could be buried there. Boy, was I excited. Later I found out that it was already sold, but really, could I be buried back in New York? California is my home. Who would ever look for me there? The kicker is that my spot of land, at this point, is in Kansas, where I have never lived either. When I was little we lived in New Orleans for three years. During that time Dad took us to a few cemeteries. Seeing it only as a child I thought it was much fun to run through rows of dead people. Later we were stationed in Washington D.C. My dad’s office over looked Arlington cemetery. We could see JFK’s grave site from his office window. Or that is what I remember. My boyfriend from that time was a history major so many of our dates were to historic spots around the DC area including cemeteries. Fast forward many years later. I retired from ATT and looked for a new hobby to fill up my time. I joined the Corona Historic Preservation Society and next thing I knew I was on the board of the Cemetery Stroll. Between genealogy and cemeteries there isn’t enough time in a day to do all I want to do. At a cemetery walk portraying Mrs. Billings. My son is holding the story board. So you can see I was primed to love cemeteries for many years. It is the history that I care so much for.My husband claims he doesn’t like them but while looking for some pictures, I found more of him in cemeteries than me. He is a good sport and is willing to go with me if nobody else will. And when he goes somewhere without me he always ask if there are any cemeteries he should take pictures of for me. So sweet of him. Sometimes I ask him to, but usually it isn’t the same if I am not there. I want to wander and look and dream. 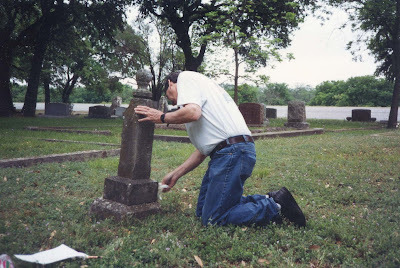 My husband Dave, cleaning his great grandfather's grave in Kerrville, Texas. I love cemeteries, yes I do, but I always say that I am not Goth, I do not like to think about anything that goes on underground and I don’t like scary stuff. I love to present talks about cemeteries. Often people don’t know what to expect but I make my talks fun and in the end they all like my stories. And I love to tell them!